La Cigale 7a+, prow, expo, sitstart. 50m to the North of Ascendência , above a parabilic antenna. Sitstart with the pedestal (7a) or without (7b), climb the overhanging prow and exit at the top. Mistral 7a, slab, wall, crimps. On a triangular boulder under the summit of the hill 126, 15m on the left and above Madagascar. Witout the right arete. Madagascar 7a+, traverse, slopers. In the middle of the slope in the South face, under the hill 126. Start at the stone, traverse on the right on a ledge of slopers and exit at the crack before the angle of La Coquinette. Colorado 7a+, overhang, sitstart. Right problem in the overhang of El Dorado. Sitstart with a foot placed in the pocket, climb the overhang and exit at the crack. Synthèse 7a, overhang, sitstart. On the south face of the boulder underneath La Flèche Noire . Sitstart near an old black arrow with the crack and exit to the right in the wall with slopers. Coup de Vieux 7a, traverse, arete, sitstart. To the right of 27, Le Dièdre Noir , along the 25 Bosses path. Sitstart under the overhang, traverse to the left and exit via the angle of Dératisation . Chien Errant (par le bas) 7a+, traverse, sitstart. Sitstart under the crack in the second face of Chien Errant as for Chien Assis , low traverse to the right, pass the angle and exit behind by a dynamic move. Diapason (assis) 6c+, wall, sitstart. Sitstart of Diapason , to the right of Vol à la Clé , 50m to the South of the intersection of La Route des Gorges de Franchard and La Route du Renard. 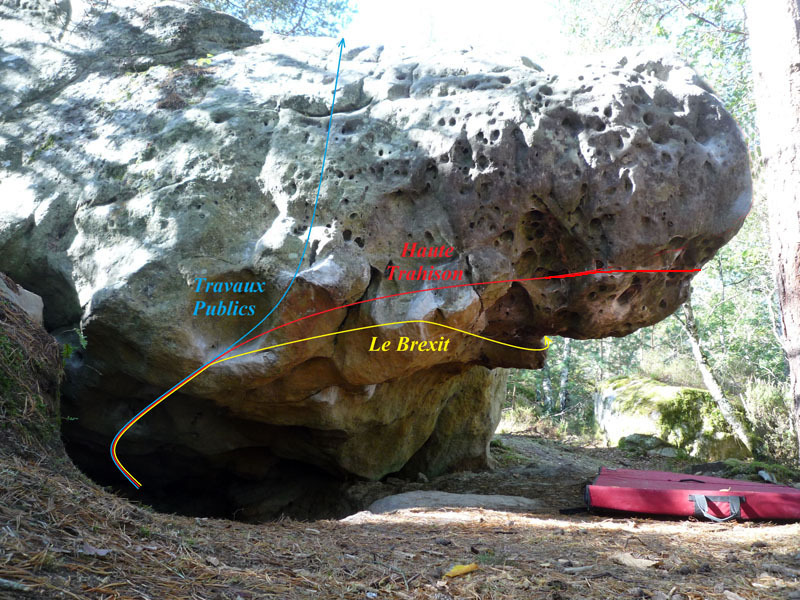 Haute Trahison 7a, overhang, sitstart, gaten. In a digged overhang, 75m to the Northwest of the picknick tables on the right of the parking lot of La Croix Saint-Jérôme. Lying start on the left with a bracelet, climb the overhang, traverse to the right and exit on the prow. See also Travaux Publics , Le Brexit , Le Brexit (rallongé) , Le Brexit (par le nez) , Le Brexit (intégral) . Salathé (debout) 6c+, crack. Dülfer-style crack at the entrance of the labyrinth. Start at the right side of the crack. Gon (assis) 6c. 1m right of 4 . Sitstart with the arete left hand and a sidehold right hand and exit directly up the prow with slopers and crimps. Ébullition 6c, overhang, sitstart. Sitstart without convention. Trompe Œil 6a+, slab. steep slab on the North face of the boulder of Chemin de Pierre . Coûts Fumants 6a, slab. 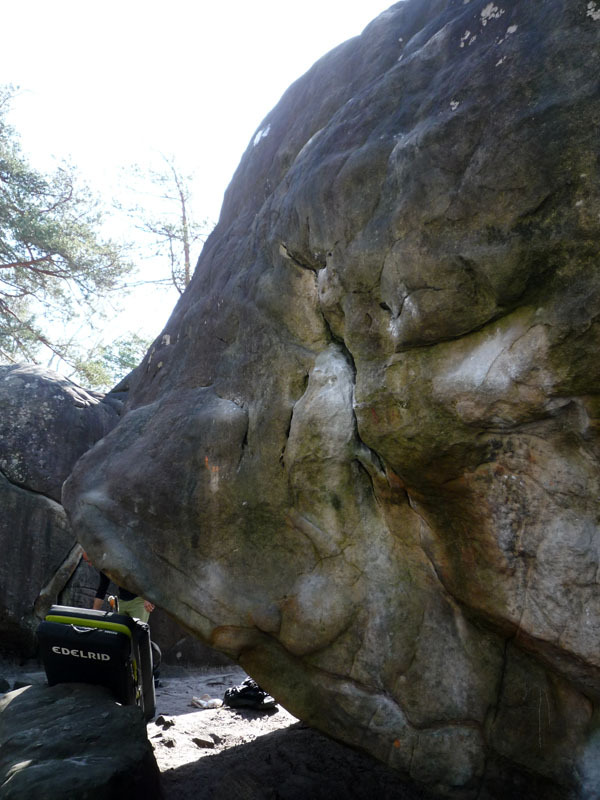 central problem on the South face of the boulder to the North-West of Chemin de Pierre . EXit to the right at the highest point is 6b. Cadeau sur Prise 6a, slightly overhanging, arete. slightly overhanging round angle on the boulder to the South of Chemin de Pierre . La Dülf du Fou 6b, arete. angle right hand on a boulder to the right of Forêt Noire . Naufrage 6a, crack. Sector 2. Crack on the North face of the first boulder of the sector. Camisole 6b, wall. Sector 2. 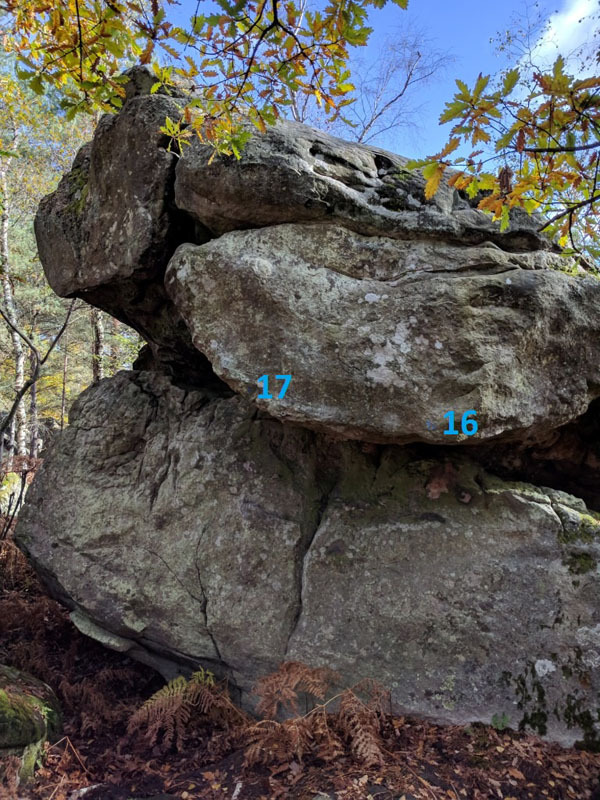 Second problem from the right on the North face of the first boulder of the sector. La Rampette 6a, arete, sitstart. Sector 2. Oblique arete to the right on the South face of the second boulder of the sector. Le Suppositoire 6a, wall, arete, expo. Sector 2. Arete right hand on the East face of the second boulder of the sector. Pain Trop n’en Faut (gauche) 5+. On the backside of the boulder of Échine . With a dynamic start from the left. Les Rondeurs du Désir (assis) 5-. On the boulder to the right of "La Tortue" (boulder with Le Sphinx ). Sitstart of the pillar on the right side of the boulder. 25, La Dalle des Boss 4-, slab. 16, Le Toit Tranquille 4-. Petite Merveille 5 , wall, arete. Arete left hand on the triangular face to the opposite of the crimpsy wall of La Poire et le Fromage , at the end of the sector, above La Route de Valmy. A morphologic variant exiting on the right of the arete is possible. Tropicale (debout) 5 , wall. Left problem on the boulder marked "K". Standing start and exit directly with good pockets. See also Chaude comme la Braise , Tropicale . 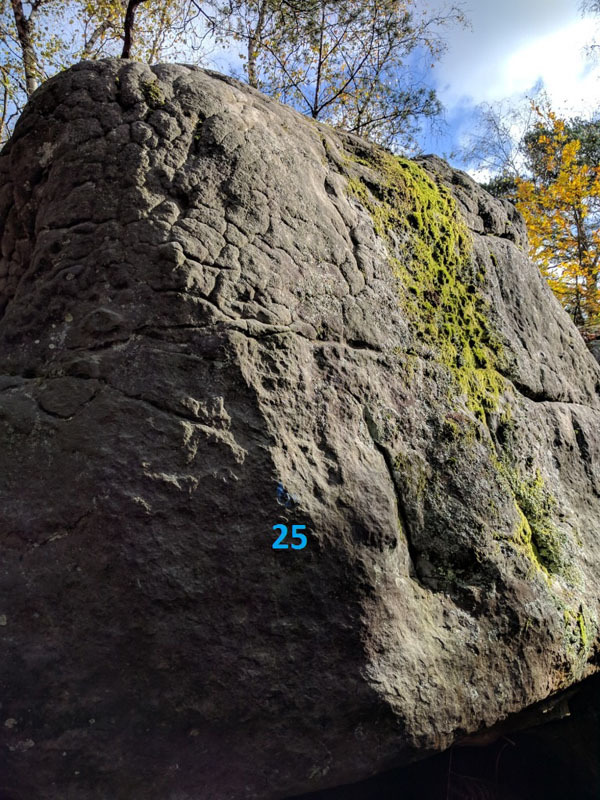 22, Panne Sèche 4 , wall, crack. sitstart is 4b. Pilier Nord 3+, pillar. small pillar. Pilier Sud 3+, pillar. small pillar. Point de Vue 3-. Former blue problem, on the boulder to the left of 15, Le Chèvrefeuille .